Taron Edgerton said that a scene cut from the first Kingsman is going to show up in the sequel. Given the specifics of what he said, we have some guesses about what it could be. Thanks to the poster and a little bit of PR hype, we know Elton John is involved in this one. I know he was definitely featured as himself in an early draft of the first film’s script. He even got to take part in a bit of action, helping to rescue... well, I won’t say who. I wouldn’t want to spoil it. But is the second film going back to pick up any of those same ideas? Matthew knows and likes Elton, and knows that he brings something that fits the tone of the Kingsman world. I think I can say that there’s a deleted scene from the first one, that I personally thought shouldn’t have been cut, and that’s now in the second film. But what it is... I don’t think I can say. I was umming and ahhing ‘cause it had a whole fun subplot about celebrities being kidnapped. And I had an idea of, who’s the worst celebrity you’d want to have locked in a cell? And I came up with Elton John, and having Elton John throwing these huge tantrums. And then I wanted to do an action scene of Elton John kicking the living daylights out of people. 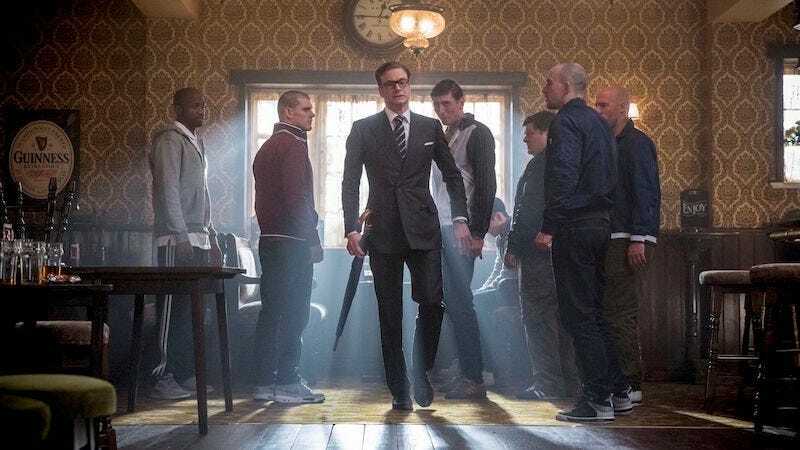 Presumably, this action scene would have taken place during the climax of the film, when Eggsy (Egerton) fights his way through the villain’s mountain lair, where important people are held in cells. That was never filmed, so that’s obviously not the cut scene Egerton’s referring to. But it could be an action scene or a comedic nod that’s being picked up. Of course, the obvious answer is that it was a scene that made the fate of Colin Firth’s character more ambiguous. He’s returning for Kingsman: The Golden Circle, which was surprising given how very dead he appeared to be in the first film. Regardless, can’t wait to be distracted while watching The Golden Circle by wondering which scene it is. Hopefully it will be a flashback and obvious.